Innovation in water chillers remains the first innovation of Enertrak. In 1982, Enertrak was the first distributor to innovate with R22 screw compressors. 30 years later, magnetic chillers are an integral part of our specialty. 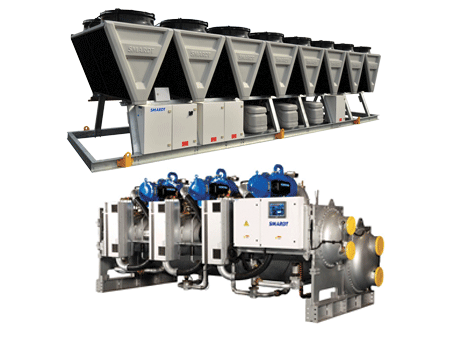 Our solutions range from 2 to 2,000 tons including a wide range of water-cooled or air-cooled chillers with modulating compressors. With the Mitsubishi Electric variable speed compressors, Turbocor oilless magnetic centrifugal compressors, Bitzer scroll or screw compressors, we have the right chiller for your application. Those who prefer avoiding chemical treatments of heat rejection units such as open water cooling towers, opt for Dry Fluid Coolers. These units are used to cool a brine glycol loop. The fluid to be cooled transfers the sensible heat from the coil to the outside air by means of a series of fans, forcing the circulation of air through the coil. 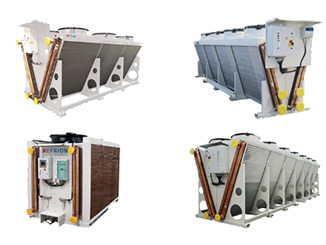 The fluid coolers offered by Enertrak innovate with different formats (Horizontal, Vertical or V-shaped) that fit well with your projects. The units of 1 to 20 fans allow rejecting up to 700 tons per unit. 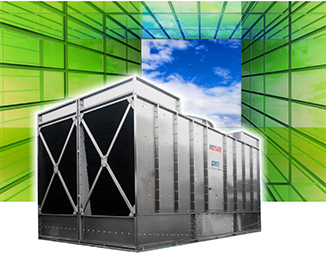 Looking to the future and energy efficiency, Enertrak offers dry and adiabatic coolers. When outdoor temperatures become critical, we use water mist to work on the wet bulb and drastically improve the heat exchanged. This creates the ideal compromise between a fluid cooler and a cooling tower. The carefully engineered Mesan construction is based on several innovative components. The use of bolts rather than self-tapping screws ensures unparalleled durability. The industry's quietest aerodynamic fans as well as the patented fan drive system, based on axial and radial bearings, will give you peace of mind. Mesan has a solution for all your water tower projects. A plate heat exchanger is a device for transferring heat between two fluids with an approach temperature as low as 1 °C. The exchange surface consists of a series of plates made of SS304 / SS316 / Titanium. The Alfa-Laval advantages: one-step plate compression, optimized distribution zone configuration, high turbulence flow, 5-point guidance system, clip-on seals and many other benefits. 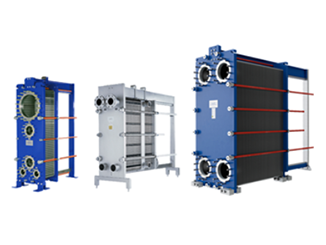 Alfa-Laval is the world leader in plate heat exchangers and it offers a range of ASME / AHRI / CRN certified products for any HVAC or refrigeration energy transfer requirements. Cooling, heating, and ventilating an office, classroom, or conference room without a fan, filter or condensation is now possible. 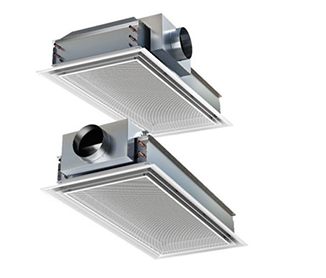 Chillded beams use the air induction effect paired with a water cooling coil to meet the needs of sensitive air conditioning and fresh air supply. Swegon's efficient, quiet and above all comfortable chilled beams are an integral part of an innovative air conditioning system. 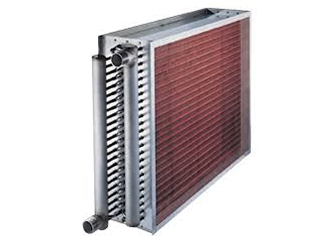 Hot water or chilled water coils are available for installation inside the ductwork or inside air handling units. Copper or nickel-copper tubes and aluminum fins are the main elements forming the coil. A steel frame and a condensation pan are also available. Our coils are characterized by the optimization of the exchange surface to maximize the heat transfer between the air and the fluid. 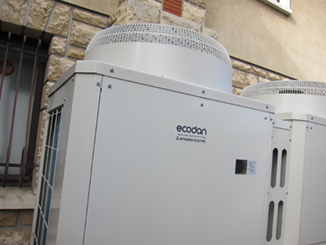 Using the outdoor air as a free and renewable source of energy, the new generation of air-to-water heat pumps are able to heat water up to 70 °C for heating applications or for domestic hot water, at ambient outdoor temperatures as low as -25 °C while having very interesting COP’s. With this system, you may be eligible for a grant from Hydro-Quebec.